The French Riviera is legendary for St Tropez, Cannes, Nice and Monte Carlo – luxury seductive resort towns for the rich and famed, known for beaches, brilliant coast and beautiful people. But neighboring Italy, the country known for wine, cuisine, climate and amorous citizens, has its own gorgeous coastline and wine country. 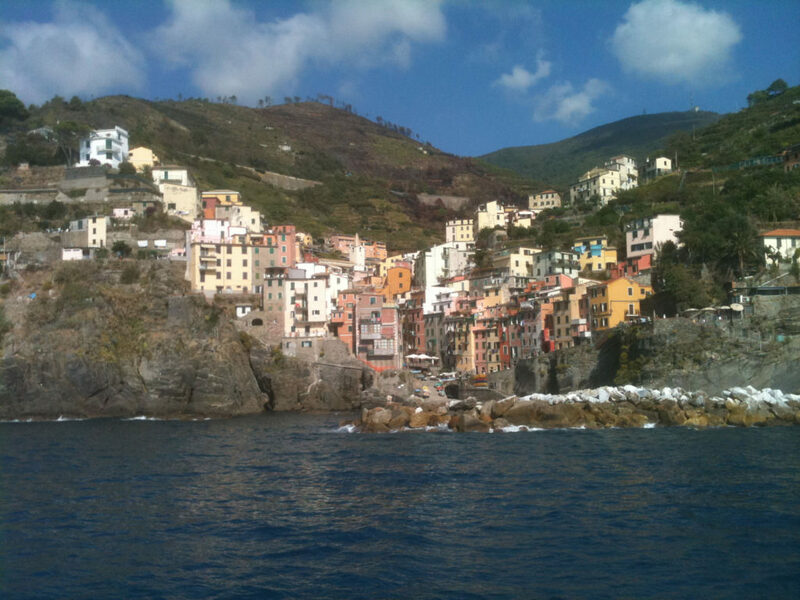 The Cinque Terre is arguably the most spectacular stretch of seaside towns clinging to cliffs on the Ligurian Sea. As a destination, Cinque Terre – the Five Lands, is an ideal place for exploration, relaxation and a true taste of Italy from centuries ago. 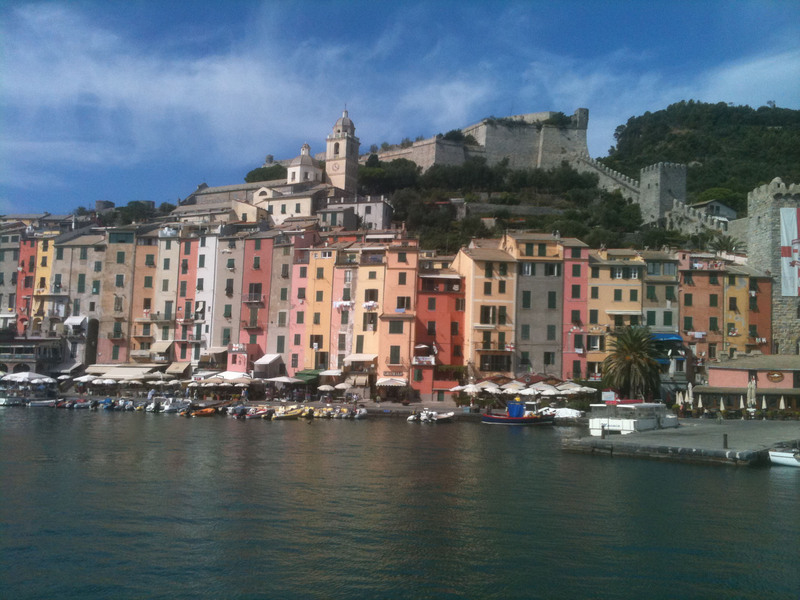 Visit in May or September, outside of prime summer months, when Cinque Terre is very busy. Tour groups and guidebooks have clued travelers into this Italian Riviera gem, so it’s far from undiscovered, and its easy to reach from Florence, Milan or Venice. Cinque Terre’s five towns descending the coast from the north east 60 miles below Genoa, are Monterosso, Vernazza, Corniglia, Manarola and Riomaggiore. 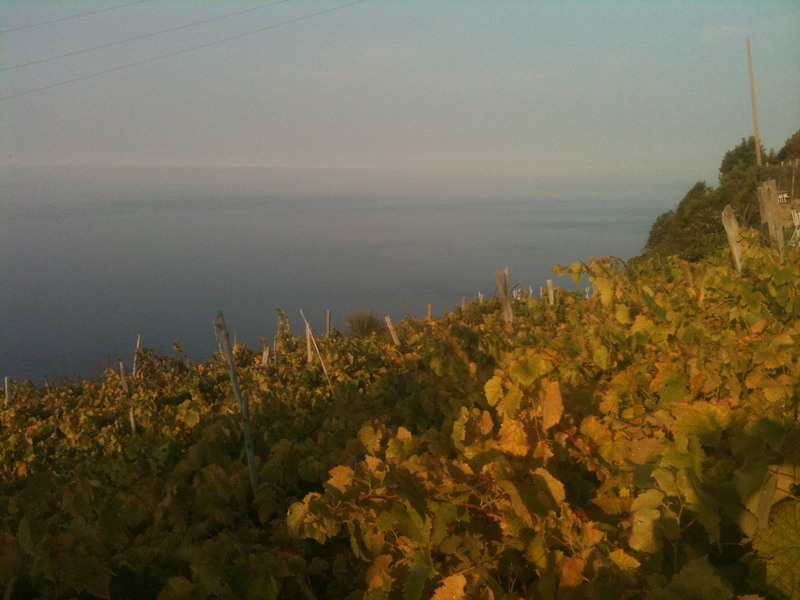 Each town has its own charm and they are all connected by train, by boat or by hiking trails (most quite rigorous) through the seasides vineyards. 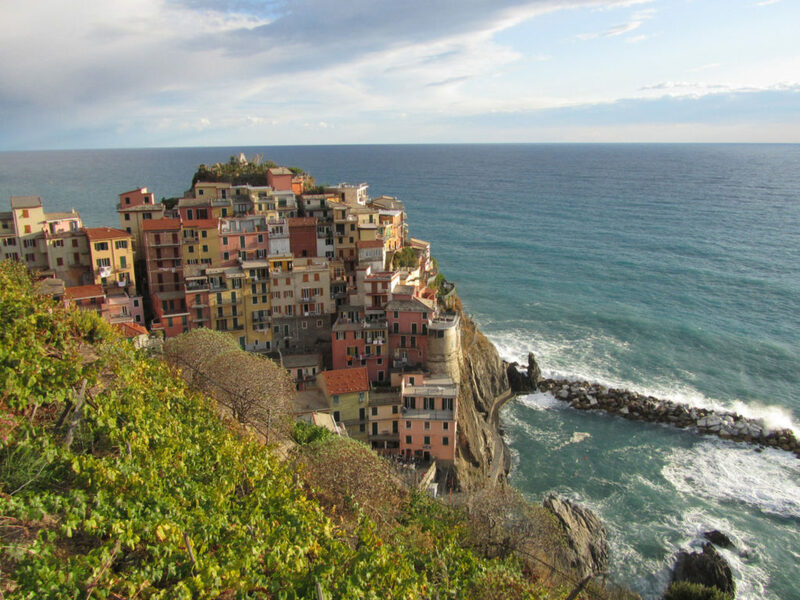 Cinque Terre is a World Heritage Park and UNESCO site, for its centuries’ old Roman paths, churches and stone fortifications that cling to the mountainsides, all of which attest to the hearty people who have lived and thrived here for hundreds of years. Drink Italy’s delicious vino bianco and Schiaccattra – a sweet but potent white dessert wine, sample the local Olive oil, Cinque Terre’s pesto and homemade foccacia– plus abundant fresh seafood from anchovies to octopus. 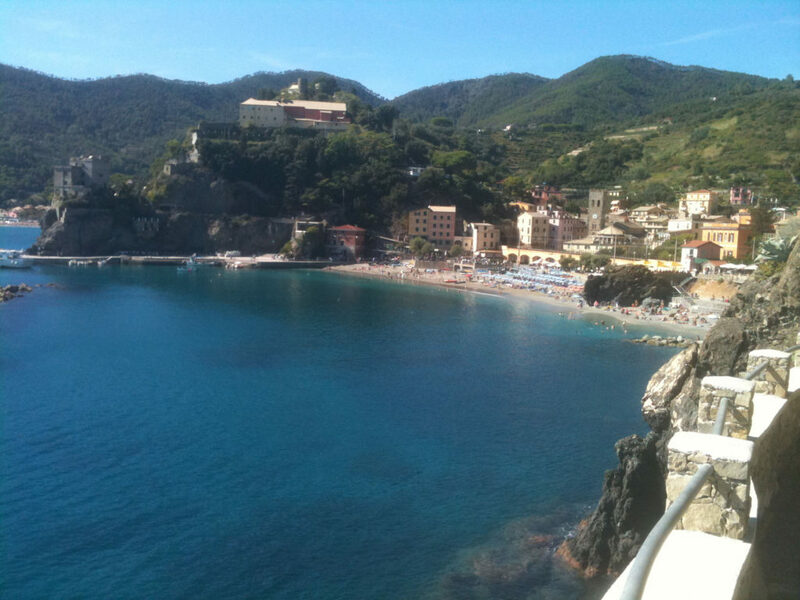 Monterosso is the most beach-like resort town of Cinque Terre, like Atlantic City of Italy, with a rather broad sandy beach overlooked by a boardwalk of shops and cafes. 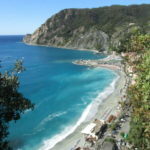 Divided into two towns, the old and new town, Monterosso is scenic and diverse -with lots of restaurants, bars and shops. 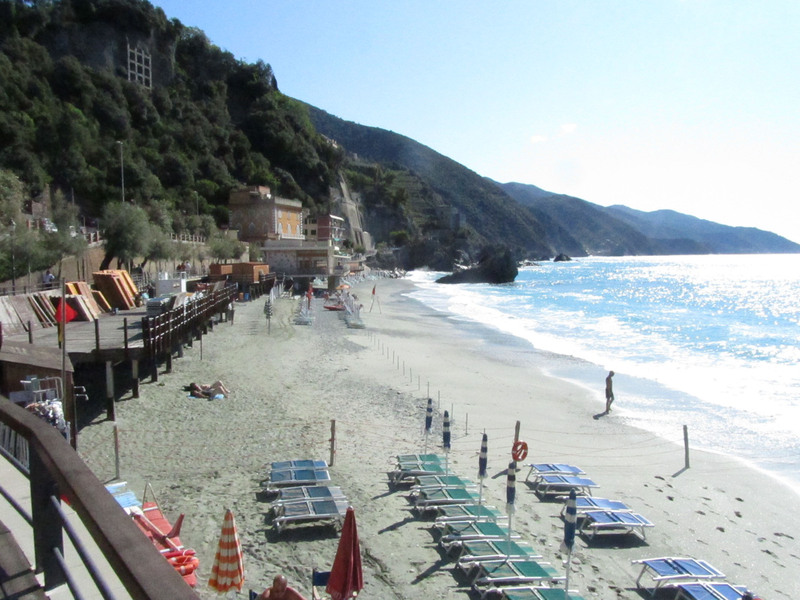 Monterosso is also the busiest – especially in beach weather, with quite a few hotels, restaurants right along the beach. But a short steep climb up stairs from the town, you will find yourself in a tranquil cemetery and convent with splendid view, the Italians honor their past relatives with the most scenic settings. 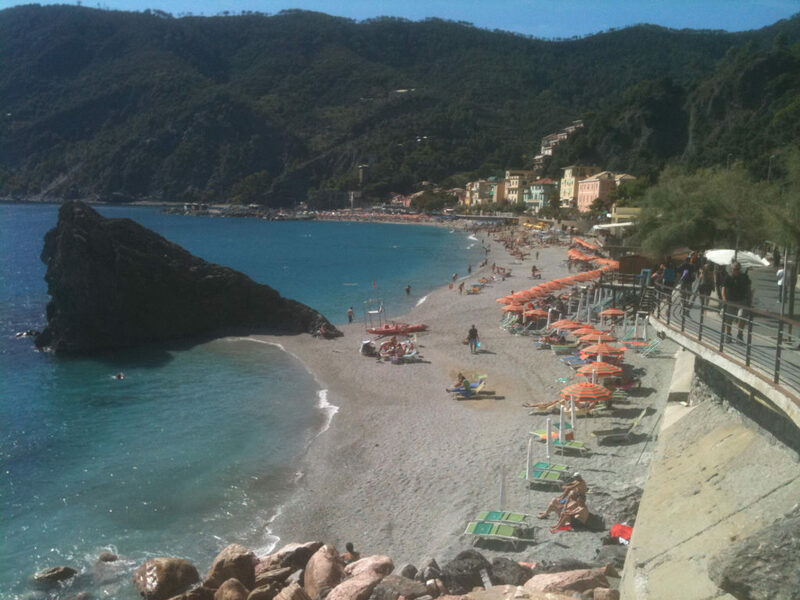 See our tips on Monterosso. 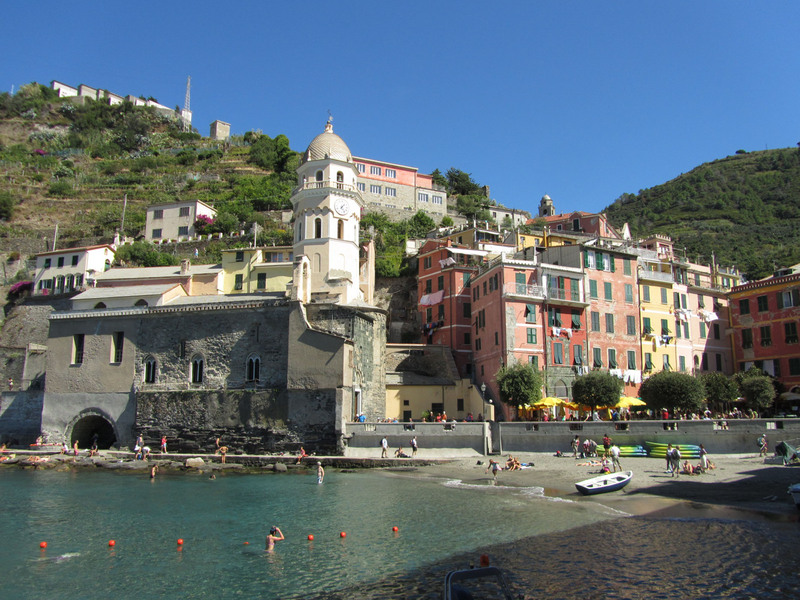 Take a boat ride from Monterosso to the other villages, ferries run almost hourly, you can stop at each village, browse, eat, enjoy, and return anytime with the all-day ticket. 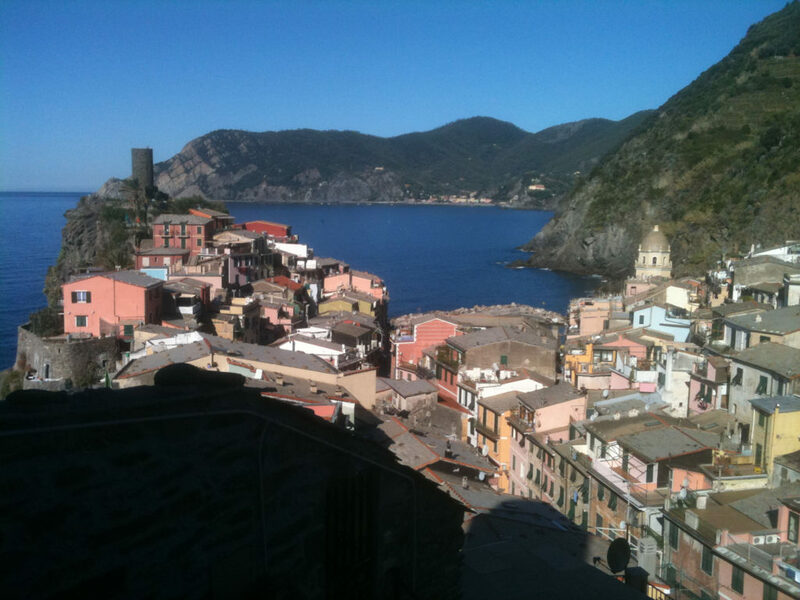 Vernazza is the next town, reached by train or boat or a rigorous 3 km hike (an hour and half) up and down, over rocks on dirt paths, with spectacular views of the sea below. This hike is somewhat strenuous, and there are no guardrails at the precipitous drop offs, so be cautioned, and wear good hiking shoes or sneakers. Your reward arriving in Vernazza is a beautiful protected harbor (a postcard setting) surrounded by a fort, a palace and a charming village with stone streets. Just strolling around the alleys of pastel colored stone buildings filled with gelato, pizza and Panini shops, restaurants and shops is a pastime. 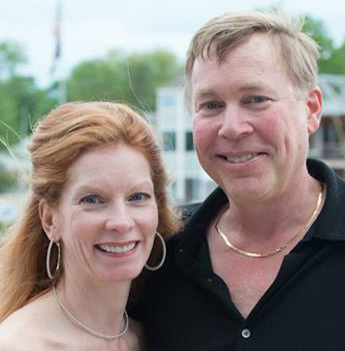 We dined at Belforte in the stone turret at the tip of the harbor – the views are stunning, the pesto and fresh fish are deliciously, and the staff is super friendly and attentive. We suggest you reserve a scenic table as soon as you arrive in town, and come back for it. Corniglia, another strenuous 4km hike from Vernazza, is unique for its perch high above the sea, no beach or waterfront – just breathtaking views from several sites. The colorful shops and cafes that line the narrow streets are worth exploring. We arrived in Corneglia in the morning via early hike and found the town to be charming, but spoke with people who arrived after noon and said the little town was crushed with people, so we recommend you go early. Besides what tastes better after a morning hike than pastry, cappuccino, or gelato in an historic village? 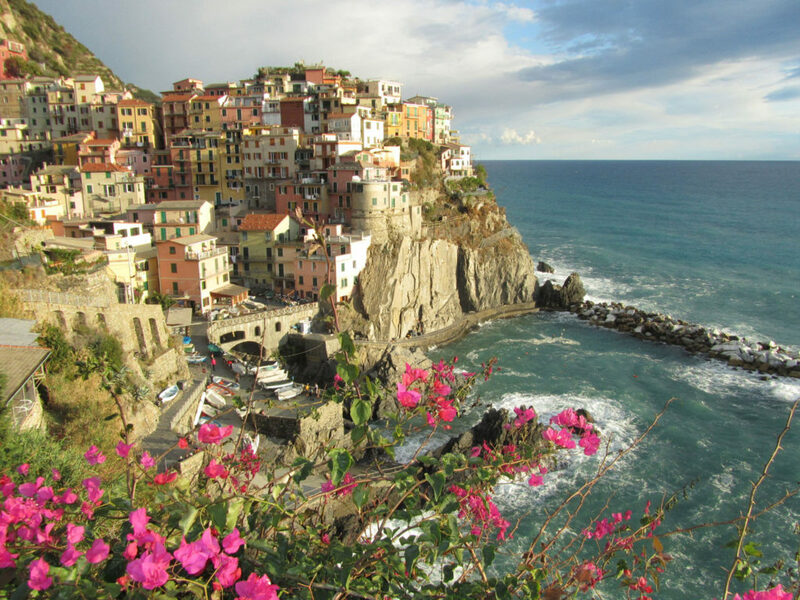 Manarola is the least touristy of all, a small center street leads past a few shops, bars and restaurants, down to a fascinatingly efficient marina – where fishermen pulley theirs boats in and out of the water up the coral cliffs. A concrete beach – spiaggia in Italian, is surprisingly popular for swimming in the azure water of the Liguria Sea, and you don’t have to worry about beach sand. You should walk the coastline pat out to the point where the Church and Cemetery are located for extraordinary views of the sea and shoreline. Above the center of Manarola, we dined at Trattoria dal Billy which serves exceptional seafood on a high perch look down into the village and up at the steep hillside terraces of vineyards. Ask for a patio table, so you can sip the delicious local Cinque Terre wine – sold uniquely here as vino de tavola bianco (house white wine) as you overlook the very vineyards its harvested from. 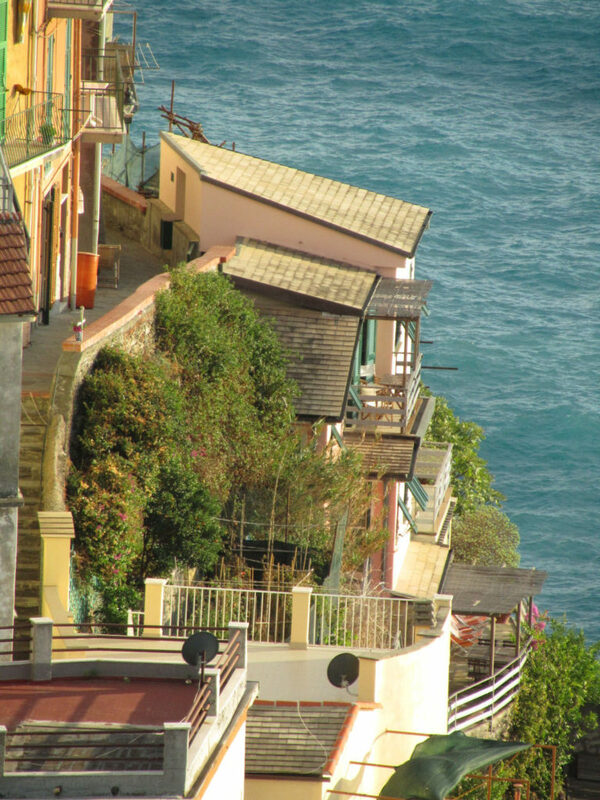 Via Dell’Amore –translation: the lovers walk, is the most famous attraction connecting Manarola to Riomaggiore. This seaside boulevard is an easy paved stroll along the sea of just 1 km (20 minutes), perfect for less fit tourists versus the more mountainous hikes between the other towns. Its fame comes from the fact that Via Dell’Amore finally connected these two villages allowing young people from the neighboring towns to meet each other (and fall in love) previously isolated by the rugged terrain separating them. As you casually walk you will see evidence of lovers locks, graffiti and pledges of amore along the way – a silly but sentimental tradition. Riomaggiore is the southernmost of Cinque Terre, with its own piazzas, olive oil and wine shops, and pizza places, plus the requisite churches. The most stunning setting in Riomaggiore requires an hour moderate hike up to the Sanctuary Madonna di Montenero – where you will have the best panoramic views of Cinque Terre up the coast over to the French mountains and Riviera and down to Porto Venere and the outlying islands. 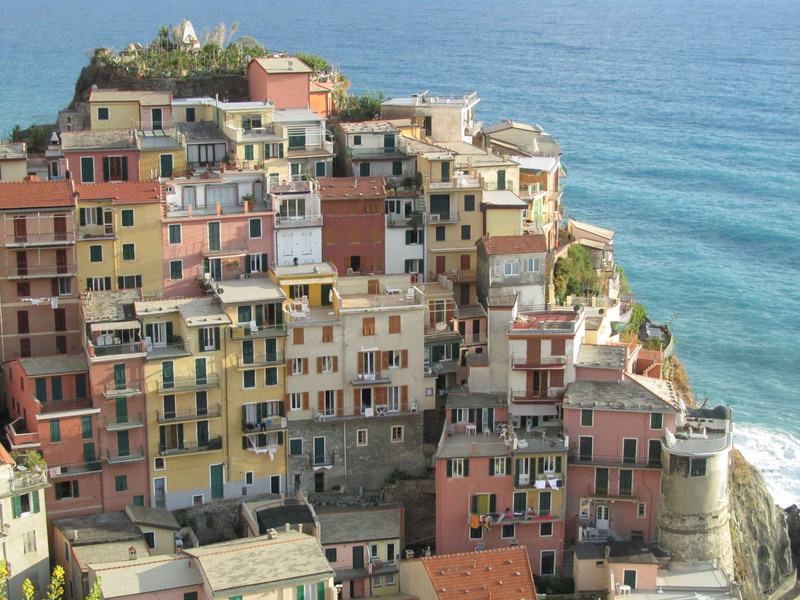 Cinque Terre is reached by Italian trains from Pisa, Bologne, Florence, La Spezia, Milan, and Genoa. 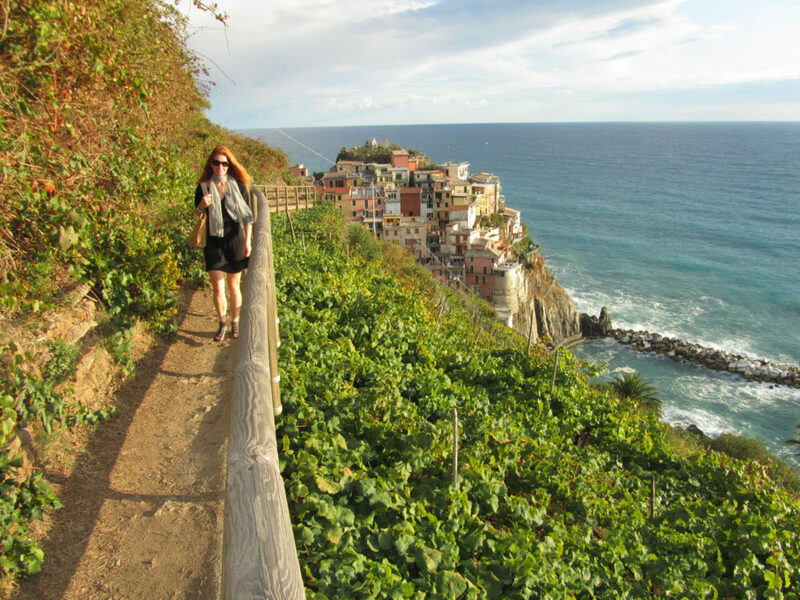 The best place to stay in Cinque Terre is quiet picturesque Manarola, in the heart of the region with a beautiful coastline and the least crowds, you can train, boat or hike daily from this central location. We recommend three days to explore the five towns with several hikes and a day on a boat visiting all the coastal villages. 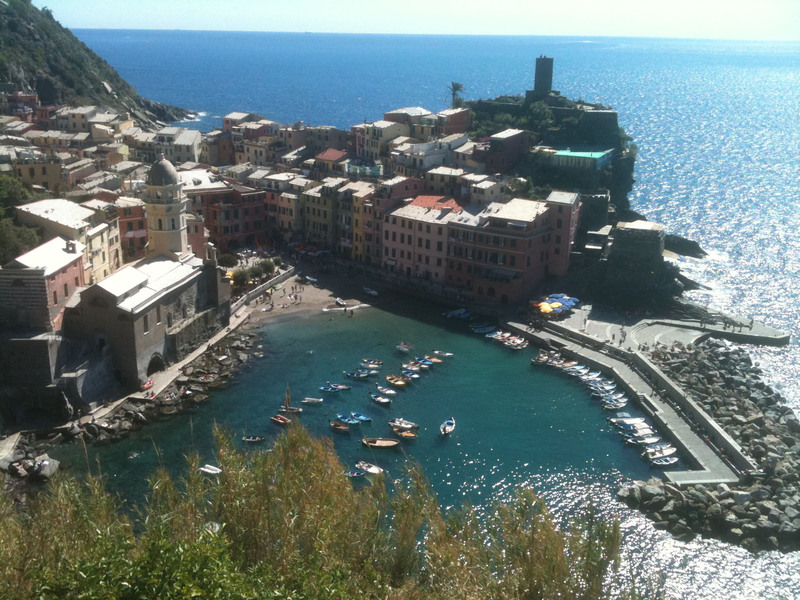 Cinque Terre is a great addition to an Italian vacation to Siena, Florence, or Venice. 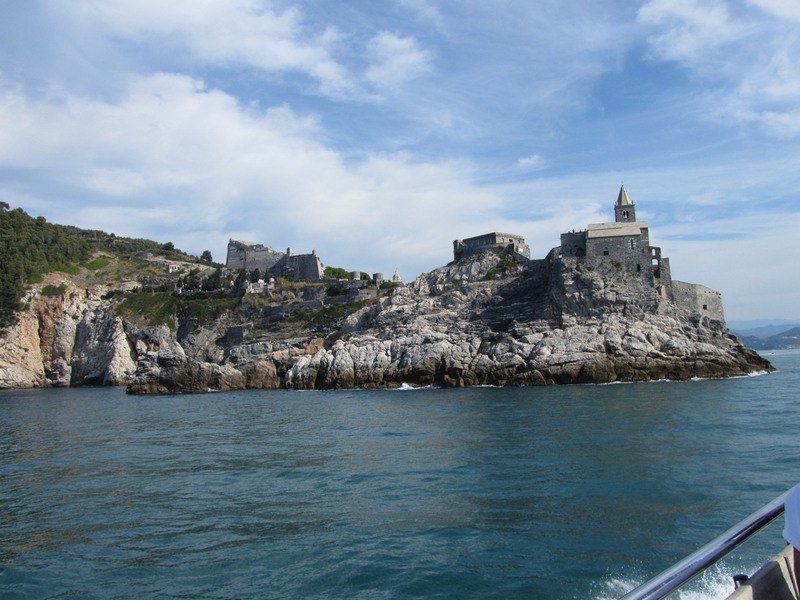 A day trip via boat ride to beautiful Porto Venere is also highly recommended if time allows. 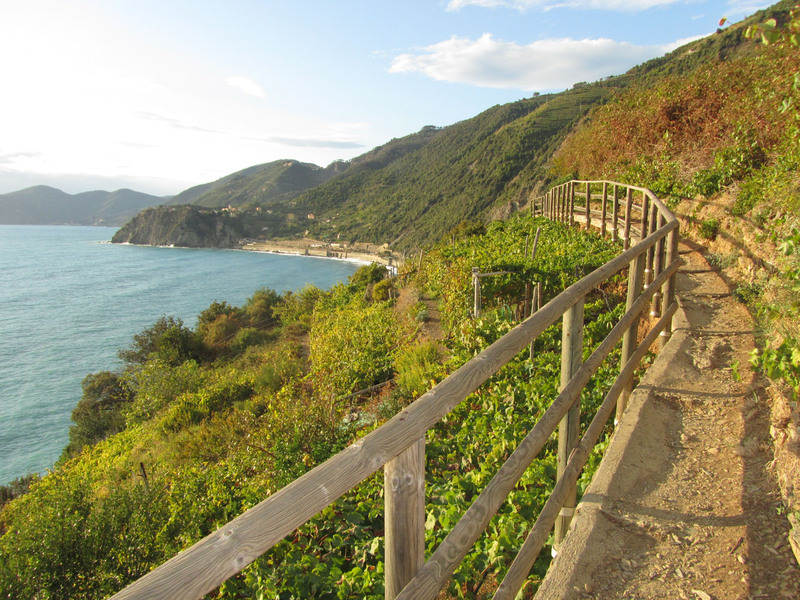 Many people try to accomplish hiking the entire Cinque Terre in one day – which requires over 5 hours of rigorous hiking of 9km and leaves little time for enjoying each town along the way. Rick Steve’s Guide to the Cinque Terre implies that the trails in The Park are accessible and walk-able for everyone. We witnessed many people not physically fit, or well prepared for such hikes – wearing flip flops and sandals. You should be fit, with hiking experience, quality hiking shoes or sneakers, a backpack with water. These trails are centuries old, over rough terrain with no services between towns, not even railings or guardrails with steep drop offs – very scenic but scary to anyone not accustomed to mountain climbing. 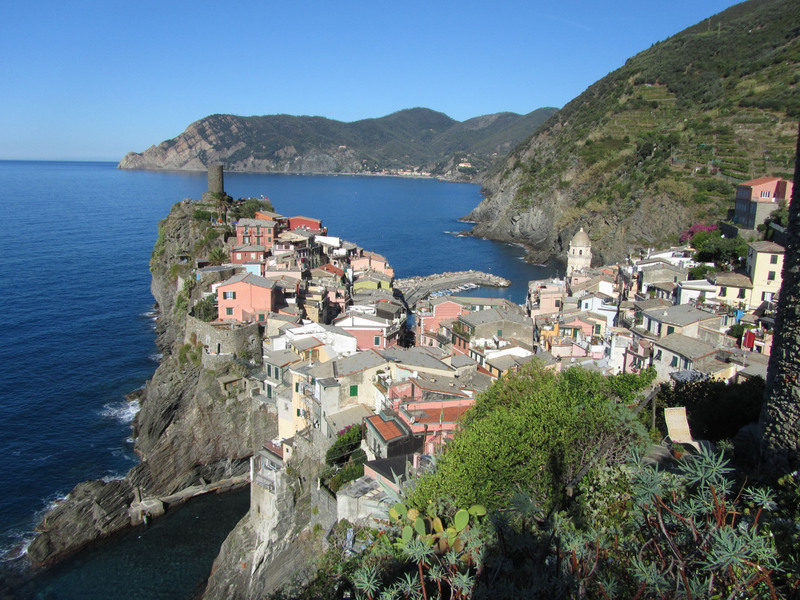 We recommend you hike the Cinque Terre in segments; enjoying lunch and a refreshing swim in the Mediterranean at each destination and considering a train ride or boat ride back to your town of origin, unless you are prepared for an intense full day thru hike. Learning Italian as a tourista! Good news – everyone speaks some English here so visitors needn’t learn Italian.